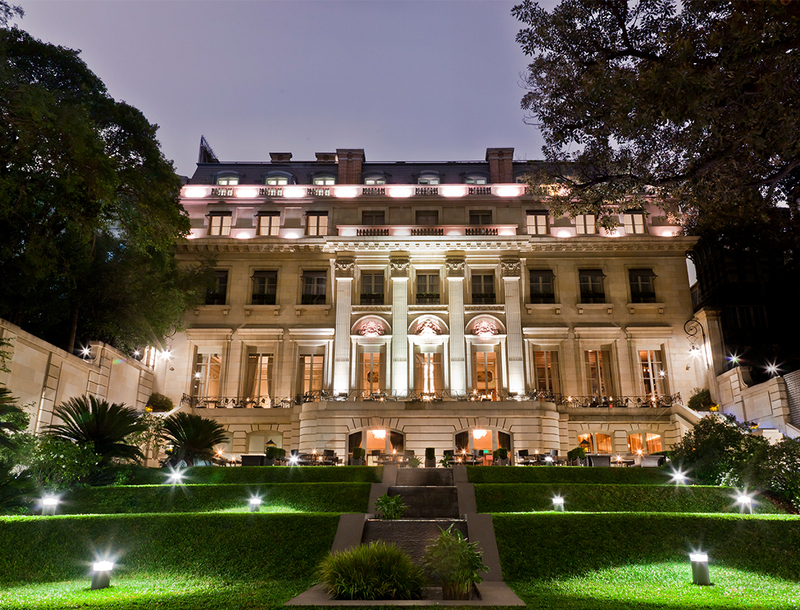 The Park Hyatt Buenos Aires combines two buildings: a neoclassical palace built in 1934 and restored in 2006 and a contemporary building that fits in perfect harmony with the original palace. The hotel opened in 2006 and has been thriving ever since. The Park Hyatt Buenos Aires has a reputation for delivering world-class service and amenities to its guests. The hotel is located on the famous Avenida Alvear (Alvear Avenue) in the Buenos Aires neighbourhood of Recoleta. The avenue is famous not only for its exclusive representation of haute couture throughout the many high-end boutiques, but also for the numerous demi-palaces and extensive presence of stylish 20th century French academy architecture. The hotel offers the utmost in luxury and indulgence for their guests. With beautifully appointed sophisticated rooms and modern spaces with a touch of French elegance. Every room features a marble bathroom with a separate bathroom and walk in shower. And each of the Palace suites also feature crystal chandeliers as well as a working fireplace. In terms of facilities, the hotel offers a spa and wellness centre. These are located within the Palace, as is an 25m indoor swimming pool, a fitness studio with state-of-the-art cardiovascular and isotonic equipment as well as a Jacuzzi and sauna. What we love most of all about this property is the multitude of art found within the hotel as well as in its own exceptional art gallery. International and local artists showcase their work here. The Paseo de las Artes Duhau is a unique underground gallery. Here you can find paintings and sculptures created by local and Latin American artists. The art throughout the public areas of the palace highlight the strength, personality, and culture of the city. Another great point is that it is open 24 hours every day. So even if you are not staying at the property, you are free to experience the impressive collection whenever you please. Then there is the food which we can only describe as nothing short of impressive. There are three restaurants and a bar each offering a different atmosphere and cuisine. In the main restaurant of the palace, the Duhau Restaurante & Vinoteca you can find sophisticated Argentinean cuisine with modern twist delivered with impeccable service. La Vinoteca (collection of wines i.e. cellar) offers 7,000 bottles of Argentinean wine. Here you can also find a cheese room with more than 40 varieties. Serving modern Italian cuisine throughout the day, The Gioia Restaurante & Terraces offers spectacular views of the Palace and the garden with an extensive seating area on its terrace provides “al fresco” dining. Los Salones del Piano Nobile faces the garden. Serving up breakfast, small dishes and elegant snacks throughout the day, the emphasis here is on afternoon tea. Finally the Oak Bar features a wood burning fireplace and a terrace overlooking the hotel garden. This is the perfect place to enjoy a cigar or brandy after a delicious dinner.